The ATI X1550 is a relatively new entry level video card. It has the ability to be installed in a low profile case much to my pleasant surprise. The system has an already installed Catalyst 3.6 driver set. When the system booted up, it picked up the X1550 as an X1300. 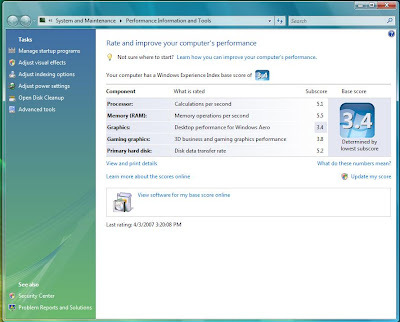 The initial Windows System Assessment Tool put the X1550 at 3.4 on desktop performance for Aero and 3.8 for 3D graphics. After downloading and installing the Catalyst 3.7 drivers, verifying that the card is now picked up as an X1550, I reran the Windows System Assessment Tool and received the same scores as the Catalyst 3.6 drivers. In my opinion, the ATI X1550 represents a good step in performance over the previous generation X1300 for about the same price. Thus, it is great value for corporate systems or entry level CAD stations.